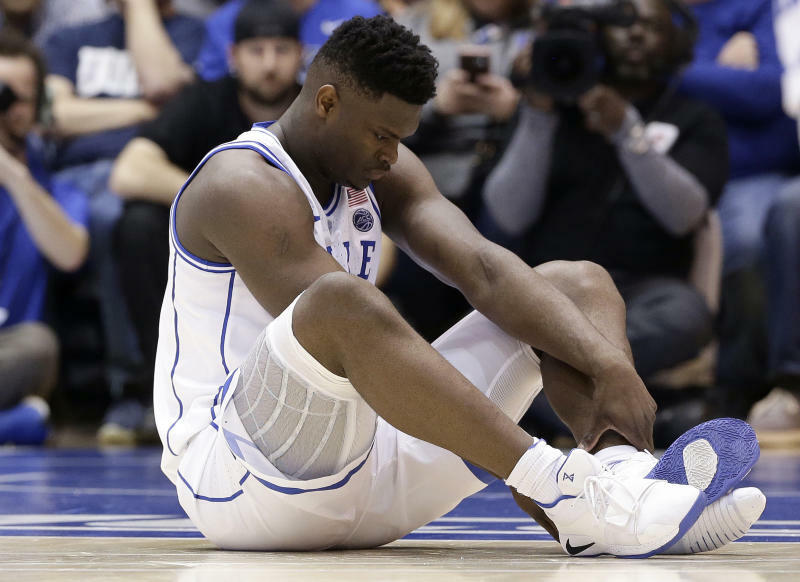 DURHAM, N.C. (AP) -- Soon after Zion Williamson's shoe ripped apart, Nike's stock price took a hit. The freak injury during one of the college basketball season's marquee games immediately sparked debates about everything from the shoe manufacturer to insurance issues and whether the likely NBA lottery pick should risk his professional future by continuing to play for the top-ranked-for-now Blue Devils. Williamson is day to day with a mild right knee sprain and is progressing as expected, team spokesman Mike DeGeorge said Thursday night. By Thursday morning, Nike, which manufactured the shoes Williamson was wearing, also was feeling the impact of the injury. The company's stock closed down 89 cents at $83.95 on Thursday as the sportswear manufacturer became the target of ridicule on social media. A spokesman said Nike has begun an investigation into what it called an "isolated" event. "Shoes have failed before, but not as visibly," said Matt Powell, a senior industry adviser for sports for the NPD Group, a market research firm. Playing before a crowd littered with celebrities — from Spike Lee to former President Barack Obama — Williamson was hurt in the opening minute of the game as his Nike PG 2.5, from Oklahoma City Thunder star Paul George's signature sneaker line, tore apart. Williamson wears that model frequently during games and hadn't had any obvious problems. The 280-pound Williamson is one of the most powerful players in the game, and he tried to plant with his left foot as his right foot was slipping. The blue rubber sole ripped loose from the white shoe and Williamson's foot came all the way through the large gap. He ended up in an awkward-almost-split, clutching the back of his right knee . He walked to the bench and a few minutes later headed to the locker room, leaving the wrecked shoe under his chair. "It hasn't happened to me as long as I've been in this shoe," George said. "We've made three generations, going on four now of my shoe, of being successful. So I didn't necessarily feel any way about that part — the negative part of it. My only concern was for Zion, honestly." Since Duke is a Nike-sponsored school, Williamson has his choice of that company's footwear. "I've seen guys bust through shoes but not sprain their knee," coach Mike Krzyzewski said. "He's gone down a couple times where he's slipped and saved the ball. That's what I thought happened. He goes so fast that maybe if there's something slippery, that happened." The injury also set off a fresh round of debate about whether Williamson — the possible No. 1 overall pick in the NBA draft, should he leave Duke after his freshman season — would be wise to end his college season in an attempt to avoid an injury that could jeopardize his pro career. NBA Hall of Famer Scottie Pippen made the case for it a month ago, saying on ESPN that "I would shut it down." Asked to respond on Feb. 5 to those comments, Williamson turned to his locker room sidekick, walk-on Mike Buckmire, and asked, "Buck, would you hate me if I shut down the season? "I couldn't do that to my teammates," Williamson continued. "Again, thank you for, like, seeing the confidence in me and the type of player I can become. But I love college too much to stop playing. I wouldn't give this up." Now that he's actually hurt, it's unknown if his feelings have changed. It's also unclear, if he decides to continue his college career, whether Williamson has an insurance policy to protect him in case of injury like many other elite college athletes have purchased. DeGeorge on Thursday could not confirm a report by Action Network that Williamson had an $8 million loss of value policy written by Winston-Salem-based International Specialty Insurance that would pay out if he slipped past the 16th pick in this June's draft. Officials at ISI did not return telephone and email messages Thursday. Spokeswoman Stacey Osburn said the NCAA allows schools to purchase loss of value policies on a player's behalf. She added that the NCAA also facilitates a disability insurance program for players in five sports, including men's basketball, in which athletes can purchase policies with preapproved financing to protect against future loss of earnings due to injuries suffered in college. Duke spokesman Jon Jackson said the university does provide the resource for athletes to purchase policies in limited cases but declined to comment on specific instances. He purchased a $1.8 million insurance policy through the NCAA program. Lattimore had a clause in his policy that it would pay out if he did not play four NFL games. Lattimore never played in an NFL game but only received about $270,000 from the policy, in part because he did get a signing bonus when he was drafted by the San Francisco 49ers in the fourth round. He purchased the policy prior to his sophomore season in 2011 then renewed it the following year. That season he dislocated his knee in a game suffered several torn ligaments when he was tackled. Lattimore currently works as the director of football player development at his alma mater. AP Basketball Writer Aaron Beard in Raleigh, North Carolina; AP Sports Writer Cliff Brunt in Oklahoma City, Oklahoma; AP Sports Writer Steve Reed in Charlotte, North Carolina; and AP Retail Writer Anne D'Innocenzio in New York contributed to this report.